What is the composition and structure of the ocean? How and why do ocean waters circulate? What role does the ocean play in climate change? Planet Earth has been called the "Blue Planet" due to the abundant water on its surface. Here on Earth, we take liquid water for granted; after all, our bodies are mostly made of water. However, liquid water is a rare commodity in our solar system. No liquid water has been confirmed in our solar system, but it is likely that Jupiter's moon Europa and Saturn's moon Enceladus have liquid oceans under a frozen crust. Nor has a drop of water been observed yet in interstellar space. Only a planet of the right mass, chemical composition, and location can support liquid water. And only on such planets could life as we know it flourish. Liquid water covers most of the surface of our planet. This water comes in many forms, each with it's own special properties. Rain is essentially pure water (consisting only of H2O with trace amounts of elements and other compounds picked up from atmospheric dust), while fresh spring water and most lakes and rivers contain more dissolved salts (~0.02-0.4 percent %, or parts per hundred,). Ocean water is much more salty and has on average ~3.5% salt content, also referred to as "salinity". Note that 3.5% equals 35 parts per thousand (ppt) which is the typical unit for which salinity is reported, and this value equals 35,000 parts per million (ppm) - a ppt is equal to 1 gram of salt dissolved into 1000 grams of water, or a gram per kilogram (g/kg). Some spring and lake waters are even saltier than the ocean, and they are often called "brines" which can become saturated with salts. These different types of water are found in many different environments on Earth. The largest and most dramatic bodies of water are our oceans. The oceans cover ~71% of the globe and have an average depth of 3,729 meters. As mentioned the average salinity is 35 ppt, but this ranges from ~33-37 ppt. Although the salinity of seawater is made up mostly of major elements like sodium (Na), chloride (Cl), sulfate (SO4), and magnesium (Mg), seawater also contains many dissolved elements in smaller quantities such as calcium (Ca), the nutrients nitrogen and phosphorus important for plant growth, and dissolved gases like CO2 and methane (CH4). There are two important points here: (1) these differences in chemical composition contribute to the diversity of ecosystems and the diversity of life that has adapted to different water bodies, and (2) the amounts of salt contribute to the weight or density of the water which is important for how water bodies are structured or layered, as discussed more fully below. How did the ocean get so salty? The answer is that the supply of salts comes from weathering of rocks on land, and then transport to the sea in rivers, plus inputs of salts from hydrothermal or volcanic vents (these topics were covered in earlier lectures in this class). One of the very first scientific attempts to estimate the age of the Earth was proposed by Sir Edmund Halley (of Halley's comet) in 1715, who reasoned by mass balance that if you measured the rate of input of salts from rivers (X tons per year), and the total salt in the ocean (Y tons), you could calculate how many years it took to accumulate the salts now found. The first application of this idea in the 1800s found that the ocean was ~90 million years old, which was in great contrast to the common idea at the time that the ocean (and the Earth) was ~ 6,000 years old. Today we know from radiometric dating that in fact the ocean is much older than 90 million yrs. It has been in existence for perhaps 3.4 billion years, and has had the same composition for probably the last 1.5 billion years. Why the big difference between 90 million and 3.4 billion? This puzzled scientists for many decades, until it was realized that the first estimates assumed the ocean kept getting saltier over time, and that none of the salts were ever removed. In fact the salts are removed by various processes including precipitation to a solid (mineral) form that sinks to the ocean bottom, and subduction of these sediments in plate tectonic movements. These "losses" of salts were not considered and thus the time needed to accumulate the salts in the ocean was too short. Thus we see how an understanding of geology and plate tectonics (as given in previous lectures) helps in our understanding of the chemical composition of the oceans. One of the most powerful tools that scientists use is the concept of "residence time", which indicates how long on average something (like sodium, Na, in the ocean) stays in the "pool" where it is found. The equation for calculating residence time (Rt) is Rt = (amount in the pool) / (rate of input or output from the pool). For example, if a classroom holds 100 students, and 100 leave each hour, then Rt = (100 students) / (100 students/hr) = 1 hr. For the oceans, we can calculate that the residence time of water itself is about 3,200 years. But for the atmosphere the Rt of water is only about 3 days -- this means that if you add a pollutant to the atmosphere in water, it will "rain out" back on your head very quickly. In the ocean the Rt of Na is ~200 million yrs, and that for aluminum is only 150 yrs. Thus the aluminum is much more "reactive", which is common for many elements like nutrients that are in high demand and taken up quickly by organisms. Note that to make the Rt calculation the pool must be in "steady state"; that is, the input rate must equal the output rate. Given this basic understanding of the composition of the oceans, we can move forward to understanding how the oceans play a role in regulating climate. Over half of the solar radiation absorbed by our planet is taken up by the oceans. This energy, once absorbed, is redistributed by ocean currents. The mass movement of water performed by the oceans plays a key role in the control of climate, and this movement depends in large part on differences in density of the water caused by variations in temperature and salinity. The density of water is determined by its temperature and salt content. Water density increases as its salinity increases, and it increases as its temperature gets colder. So, warm, less salty water floats on top of (is less dense) than cold, more salty water. These differences in density of seawater have profound effects on ocean circulation and the transfer of important elements like nutrients. When water evaporates, it leaves behind dissolved salts, making the remaining water more dense and more likely to sink to the ocean floor. In this way important nutrients or other important elements such as dissolved oxygen are cycled toward the ocean floor in a process known as "bottom-water or deep-water formation". From a climate point of view, this sinking water also takes with it the greenhouse gas CO2 which has been absorbed by the ocean from the atmosphere, thus "removing" the gas from interacting with the atmosphere (at least for a while...). As you will see later in the lecture on Earth's carbon cycle, this absorption of CO2 is a major process determining the concentration of greenhouse gases in the atmosphere. In addition, much of this deep-water formation occurs in polar regions, where the surface water in contact with the atmosphere gets very cold (so more dense), and if it forms ice then the salts are excluded from the ice and thus the remaining water becomes even more salty and more dense. The widespread sinking action of dense, saline water can drive large-scale ocean circulation. This subsurface ocean circulation produced by a combination of temperature and salinity change is called "thermohaline circulation" ('thermo' for temperature and 'haline' for salt). This type of circulation is distinguished from circulation at the surface of the oceans, which is driven by wind. The salinities of the Atlantic and Pacific oceans are shown in Figure 1 for north-south cross-sections of the Atlantic and Pacific oceans. Note the effect of enhanced salinity due to outflow from the Mediterranean. When more dense water overlies less dense water it must sink, and this sinking drives the subsurface ocean currents. The North-South thermal structures of the Atlantic, Pacific, and Indian oceans are shown in Figure 2. Several features are of interest in this figure. Temperature tends to be highest at the surface, with the deep waters being largely isothermal (having a constant temperature with depth). As a consequence, the temperatures are high in the top 1000 meters and drop thereafter. The warmest temperatures are near the equator, as expected, with the polar water being relatively cold and isothermal. Because of the nature of the thermal structure, it is often useful to think of two separate ocean reservoirs, a surface zone separated by a transition zone (called a 'pycnocline' - 'pycno' for density, and 'cline' for transition) from a deep zone. This layering is called stratification and it is an important concept to grasp in order to understand how lakes and oceans are physically structured, and how that structure influences the movement of water. Unlike the atmosphere, which is characterized by very turbulent weather systems that move quickly, the ocean is a fairly stable place. This is because it is heated from above, in contrast to the atmosphere, which is heated from below. Because warm fluids (air and water are both fluids, one is just much more dense) are less dense and want to rise, the rising warm air in the atmosphere creates turbulence and and large structures such as "convective clouds" which lead to "convective storms" that you hear about on the Weather Channel. (Convection is just the movement of fluid due to its temperature, rising if warm, sinking if cool.) Thus the warm water in the ocean has nowhere to rise to because it is already at the top, so, there is little turbulence generated. As is shown in Figure 2, the relatively warm surface waters float on top of the colder and denser deeper waters, which leads to a generally stable situation. But we know that there is still water movement from top to bottom in the ocean, because we know there is oxygen in the bottom of the ocean. If the stratification (layering) in the ocean was very strong and never disrupted, decomposition processes by microbes in the bottom waters would consume all of the oxygen and we would find only bacteria and viruses that can live without oxygen, and none of the fantastic diversity of life that exists now. Thus it is evident that the bottom waters must be re-supplied with oxygen from the atmosphere from some large-scale water motion or circulation in the oceans. Different sources provide energy for these different types of motion. Surface and deep currents are powered by solar radiation. The energy source for the tides is gravitational attraction of the Earth and Moon. The Earth's internal heat provides energy for tsunamis, through the action of earthquakes. In this lecture we will focus on the first two types of circulation: surface currents and deep currents. Figure 3. Global Surface Currents. Surface currents are forced by frictional interaction between the ocean surface and the prevailing atmospheric wind. The wind imparts its momentum to the top layer of the ocean. In each ocean, the prevailing trade winds drive equatorial ocean currents from east to west. When these currents encounter land, they divide to flow north and south along the eastern borders of the continents. As they progress, they are deflected to the right in the Northern Hemisphere and to the left in the Southern Hemisphere by the Coriolis Effect (see this link for a detailed explanation), creating large vortices or gyres, which are very large horizontal cells of water circulation. Figure 3 illustrates the large-scale surface currents. Notice the large clockwise gyres in the Northern Hemisphere and the counter-clockwise gyres in the Southern Hemisphere. Small west-to-east counter-currents are seen near the equator. The famous Gulf Stream (currents number 1 and 2) carries more than 20 times the total amount of water in all the rivers and streams in the world! The Coriolis Effect forces surface water at an angle of ~45o to the direction of the wind. As momentum passes downwards through ocean layers, the currents rotate further under the influence of Coriolis and moderate in force. The net result is what is known as an "Ekman Spiral" motion (shown in Figure 4). On average, the surface waters, taken as a whole, tend to move perpendicular to the prevailing wind (to the right in the Northern Hemisphere and to the left in the Southern Hemisphere). Figure 4 shows the Ekman Spiral for the Northern Hemisphere. For a wind blowing southward along the coast of California, the ocean current will be seaward. As the waters are forced seaward, underlying waters that are colder move upward to take their place (see below). The region over which the current actually reverses direction is known as the friction layer (~100 m depth). The Ekman Spiral helps explain why the waters off the coast of California, and in fact all along the West Coast of the U.S., are so cold (see Figure 5). The cold waters off the coast of California are clearly unusual. Water temperatures closer to what one might expect for the latitude (about 10° F higher) are found to the north and the south of the localized cold zone. The Ekman Spiral has a different direction in the Southern Hemisphere than in the Northern Hemisphere. In the southern hemisphere the rotation is to the left, whereas the rotation is towards the right in the northern hemisphere - these differences are due to the Coriolis effect). Figure 5. Ocean temperature isoclines (isotherms, lines of equal temperature) off the West Coast of North America. The cold waters off California are produced by the same "upwelling" process that results in cold surface waters off the western coasts of South America and Africa. The process is related to the offshore surface current driven by the prevailing winds, which blow parallel to the coast. Figure 6. Upwelling off the California Coast. Figure 6 shows the upwelling process for the case of California surface waters. The prevailing wind blows from north to south along the coastline and, in conjunction with the Coriolis Effect, forces the surface waters westward and out to sea. The waters in this seaward current are replaced from below. The forced upwelling of cold deep water cools the surface waters and brings vital nutrients upwards to support a rich food chain, including large numbers of photosynthetic algae called phytoplankton (the word algae is general for any small photosynthetic plant, such as found on a rock in a stream; phytoplankton are specialized algae that float in the water column of oceans and lakes). This situation in Californian coastal waters is repeated off the coast of Peru, with the difference that the Peruvian cold waters are in the Southern Hemisphere. The Peruvian waters support an incredibly rich food chain, including the world's most important anchovy fishery. Because the upwelling currents are forced by prevailing winds, they are affected by changes in the strength of these winds. A phenomenon known as El Niño occurs periodically in Peruvian coastal waters. This term refers to the occasional situation when the trade winds slacken sufficiently to cut off the Peruvian upwelling, leading to an increase in the temperature of the surface waters. It is called El Niño (the Christ-Child in Spanish), since it often occurs around Christmas time. During these events, most of the phytoplankton or algae are starved of the nutrients normally brought up from the deep waters and die away. Sometimes, the die-off is so rapid and intense that the decomposing bodies of the phytoplankton, and other sea creatures that depend on them for food, leave a foul smell on the ocean. Figure 7. El Niño influence in the Pacific Ocean. Figure 7 shows the region of the Pacific Ocean that is anomalously warmed during El Niño events. The size and extent of surface-water warming affects the Earth's climate on a truly global scale, with certain areas of the world experiencing drought while others experience greater rainfall. El Niño events occur sporadically every 3-5 years or so and last for a year or two. Some of the unusual weather experienced in 1997-98 (large floods on the Mississippi River) has been ascribed to an El Niño event. El Niño events are also sometimes referred to as "ENSO" events (standing for El Niño, Southern Oscillation events). One of the effects of an ENSO event is a rise in sea level off the coast of South America and a drop in sea level off Australia. El Niño events occur sporadically but fairly often (one every 3-5 years or so). They are almost impossible to predict, at least so far. The opposite (and more normal) situation to El Niño is sometimes called "La Niña" - good fishing time! Figure 8. Great Ocean Conveyer Belt. A large-scale circulation of the oceans involving a deep current carries more than 30 times the volume of all the rivers of the world combined. We will call this 3-dimensional current the "Conveyor" or "Conveyor Belt" (Figure 8). The conveyor belt is a globe-straddling ocean current that keeps Northern Europe unusually warm for its latitude. The Gulf Stream is one leg of this current system. It functions to transfer heat from the relatively warm tropics to the relatively cold polar regions. The extra heat received by Northern Europe is brought by the conveyor-belt-like ocean current. The part of the conveyor near the ocean surface moves to the North in the Atlantic and to the south in the Pacific. In the Atlantic, the surface of the conveyor carries warm water to a region near Iceland, where it cools and sinks, returning to great depth. The convergence of this warm surface current and cold Arctic air allows for effective transfer of heat to the atmosphere, keeping northern Europe warm. The amount of heat involved is very large: about 30% of the total solar energy received by the entire Atlantic! As the waters cool due to this heat-transfer conveyor, they become more dense and sink, feeding the lower part of the conveyor. This sinking is the deep-water formation described above. The sinking action of the conveyor at its northernmost extreme in the Atlantic is aided by its extra salinity. There is a slight imbalance between evaporation and runoff in the Atlantic, which causes it to be saltier than the Pacific. (Some of the water evaporated from the Atlantic ends up raining into the Pacific, either directly or from runoff via rivers and streams. Water evaporates in its pure form, leaving behind salt and other solutes. The net effect of this imbalance is to make the Atlantic more saline than the Pacific.) This difference in salinity between the Atlantic and the Pacific is a driving force behind the Conveyor. This type of circulation, powered by differences in temperature and salinity, is referred to as Thermohaline Circulation (Heat-Salt Circulation). Figure 9. Energy transfer through the Conveyer Belt. The importance of the ocean conveyor to climate is impossible to overstate. Without its moderating influence on the climate of Europe, Paris would have roughly the same climate as the Hudson Bay and human history would have been undoubtably quite different! Figure 9 illustrates the effect of the transfer of energy from the warm surface current to the air blowing from Canada towards Europe. To recap: at the northern Atlantic limit of the ocean conveyor belt, surface waters release heat into the atmosphere, greatly moderating Europe's climate. The subsequent plummeting of the cooled, more dense water from the arctic and subarctic oceans to greater depths simultaneously enriches the bottom waters with oxygen, allowing great diversity of life in the deep ocean. The cycle is powered, in part, by the extra salinity of the Northern Atlantic waters, due to the higher rate of evaporation compared to the Pacific. It is also powered by the cold arctic waters that freeze and in the process of excluding salts from the ice (the ice is like distilled water), become even more dense. So how could this conveyor belt have affected the paleoclimate that we talked about in the last lecture, especially some of the short-term variations? There is evidence that the conveyor has "stalled" (stopped or been reduced in strength dramatically) once within the past 12,000 years; this time is known as the brief cooling period called the Younger Dryas. The Younger Dryas was a period of dramatic cooling on Earth that was a brief reversal of the warming trend coming out of the last glacial maximum 20,000 years ago. Starting around 11,000 years ago, during the warming, there was an abrupt cooling that lasted ~700 years and led to enormous but short-lived changes in the climate of Northern Europe. These changes were first noted in the pollen records from lake sediments, which indicated a change-over from forests to cold-adapted herbaceous plants (such as Dryas, a plant that thrives on arctic and alpine tundra) and back to forest again. In the early 1980's, evidence for the Younger Dryas was obtained from CO2 ice-core bubble measurements and confirmed that it was an event of global significance (since carbon dioxide is well-mixed throughout the global atmosphere). The Younger Dryas period has caused much debate, since it challenged the previously-held idea that climate could only change very gradually. It had been thought that the thermal inertia of the ice sheets was so large that significant advances or retreats could only happen over long periods of time. The Younger Dryas demonstrated unambiguously that change can be abrupt. Thus, climate appears sometimes to respond in a manner similar to earthquakes where stress and strain builds up over years, leading to sudden abrupt changes, rather than slow incremental changes. Figure 10 provides a synopsis of what we suppose happened to the temperature of the North Atlantic Basin during the Younger Dryas. The top panel shows the changes in solar radiation expected from a consideration of the Milankovitch cycles over the past 30,000 years. The bottom panel shows the sluggish (lagging) response of the melting ice caps. The middle panel shows the paleoclimate temperature record. during the abrupt cold of the Younger Dryas (YD). Figure 11. Retreat of the polar ice cap. 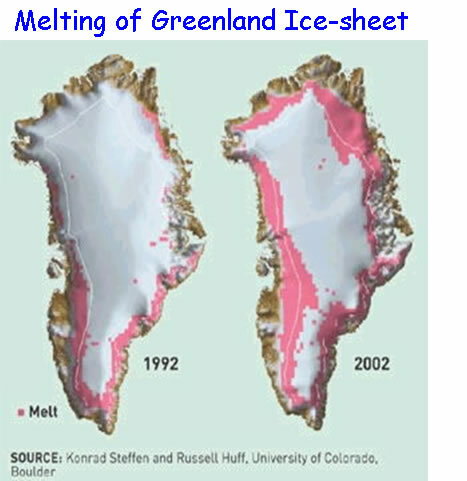 Consider the melting of the polar ice cap as it retreated (Figure 11). Initially, all the runoff waters would have been channeled into the Gulf of Mexico along the Mississippi and its tributaries because the border of the ice sheet was still so far south.. At some point, when the glaciers had retreated northward to about the latitude of Northern Lake Superior, the runoff waters would have been diverted to flow out along the St. Lawrence into the Northern Atlantic. At first these waters built up in giant inland lakes, perhaps blocked by remnant ice blocks. Once this inland freshwater sea "broke loose", the water flowed to the ocean and because these fresh waters had very low salinity, they would have floated on top of the sea and inhibited the downward plunge of the conveyor belt. This sudden release of vast amounts of fresh water into the Northern Atlantic might have been sufficient to stall the Conveyor belt completely, leaving Europe without its moderating influence. After the initial shock of the fresh water runoff had been absorbed, the Conveyor would have started up again, returning the climate to its ordained "Milankovitch cycle" path. The timing of the retreat of the polar cap ice past Lake Superior has been shown to be coincident with the onset of the Younger Dryas. The example of the Younger Dryas is a warning that climate change can be unpredictable and abrupt. Stresses on the system can build up until, almost without warning, a sudden and fundamental change occurs on a short time scale. These abrupt changes may represent "tipping points" (like a water balloon filling up nicely and then suddenly it breaks) in the ocean-atmosphere interaction that drives our climate system. These tipping points are inherently difficult to predict, and represent one of the most worrisome and perhaps dangerous outcomes of the current global climate change and warming that we are experiencing. A "Hollywood" version of these tipping points is seen in the film "The Day After Tomorrow". These basic differences in the configuration of the conveyor belt and its effects on climate are shown below. Figures 12 and 13. Configurations of the global conveyor belt and the implications for climate change on Earth. One potential cause of shifts in conveyor-belt circulation is the melting of ice caps. The large Earth in the center (Figure 12, left above) shows the cold climate state prevailing during most of the Normal Ice Age, where the conveyor belt was operating but it was shifted to the south due to the polar ice caps. The bottom Earth shows an advance of the Conveyor Belt into the Nordic Seas, resulting in a warm anomaly and Rapid Warming. 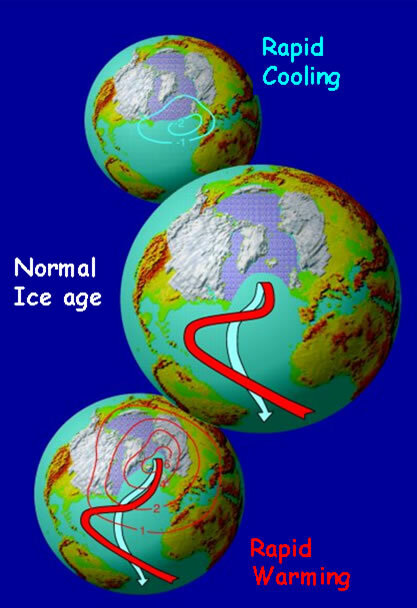 The upper globe shows climate when the Conveyor Belt collapses, such as occurred during the Younger Dryas period, which resulting in Rapid Cooling. Concerns today are centered around the rapid melting of the Greenland ice cap, which injects less dense, fresh water into the North Atlantic and may contribute to placing a freshwater "lid" on the North Atlantic, thus preventing the formation of North Atlantic Deep Water that drives the global conveyor belt. Weakening of the conveyor belt circulation would also reduce the amount of CO2 that can be absorbed from the atmosphere and transported into the deep ocean water, meaning that a positive feedback loop would be set up by more CO2 in the atmosphere causing higher temperatures and more ice-cap melting, which weakens the conveyor belt, which reduces the amount of CO2 taken up by the ocean, which increases the CO2 in the atmosphere, which causes higher temperatures. It is both these kinds of feedback loops, and the kinds of abrupt climate change seen in the Earth's recent past, that have scientists and others extremely concerned about rapid climate change on our planet. Salts in the ocean come from weathering of rocks on land, and inputs from hydrothermal and volcanic activity in the ocean itself. The overall chemical composition of the ocean is quite stable, but local variations in salinity and temperature create differences in water density in the oceans, which in turn have large impacts on ocean structure and the movement of water currents. The ocean structure is more stable because it is heated from above, compared to the atmosphere which is fundamentally turbulent and rapidly changing because it is heated from below. However, winds do drive surface currents, and differences in water density cause water sinking that establishes a deep-water, 3-dimensional thermohaline current that encircles the globe (the Conveyor Belt). The oceans play an important role in controlling the climate of the Earth. Surface water currents and the Conveyor Belt effectively transport energy from low to high latitudes, which moderates the climate of Northern Europe. Upwelling of cold, nutrient-rich waters on the west coasts of continents is forced by a combination of prevailing winds and the Coriolis Effect. When upwelling off the coast of Peru slows, we have the El Ni�o condition, which can cause global climate changes and lead to substantial societal impacts. There is evidence that during the Younger Dryas period ~11,000 years ago, the Conveyor Belt was weakened and the Earth was thrown into a severe cold period. Thus, abrupt, rapid climate changes can be very strong and can be caused by a breakdown of the atmosphere-ocean interactions that control climate. Send feedback to the Global Change Webmaster. All materials © 1996-2009 by the University of Michigan.